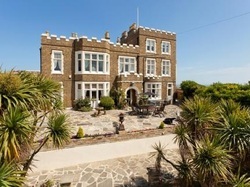 Set on the cliff overlooking Viking Bay, this early 19th century building was once home to Charles Dickens - the author is known to have leased the property (then known as Fort House) for use through the summer months during the mid 1800's. The house was significantly enlarged in 1901, but there's no doubting that he would still recognise it today. Unsurprisingly, the guest rooms are named after Dickensian characters, The Fagin superior room and Little Dorrit's classic double among them. Those with a particularly keen interest in the author, however, will no doubt be most keen upon the room he personally used during his time here. Indeed, the room also contains a bed reputedly slept in by Queen Victoria, and even boasts access to the very study in which Dickens worked on David Copperfield.